اله دادی, مریم, حجازی, سحاب, جنوبی, مهدی, عبدالخانی, علی, جمالی راد, لعیا. (1395). تاثیر خمیرسازی شیمیایی باگاس و جفت‌کننده روی خواص فیزیکی-مکانیکی چندسازه‌های حاصل از خمیرکاغذ باگاس/ پلی‌اتیلن‌سبک. مجله صنایع چوب و کاغذ ایران, 7(3), 349-362. مریم اله دادی; سحاب حجازی; مهدی جنوبی; علی عبدالخانی; لعیا جمالی راد. "تاثیر خمیرسازی شیمیایی باگاس و جفت‌کننده روی خواص فیزیکی-مکانیکی چندسازه‌های حاصل از خمیرکاغذ باگاس/ پلی‌اتیلن‌سبک". مجله صنایع چوب و کاغذ ایران, 7, 3, 1395, 349-362. اله دادی, مریم, حجازی, سحاب, جنوبی, مهدی, عبدالخانی, علی, جمالی راد, لعیا. (1395). 'تاثیر خمیرسازی شیمیایی باگاس و جفت‌کننده روی خواص فیزیکی-مکانیکی چندسازه‌های حاصل از خمیرکاغذ باگاس/ پلی‌اتیلن‌سبک', مجله صنایع چوب و کاغذ ایران, 7(3), pp. 349-362. اله دادی, مریم, حجازی, سحاب, جنوبی, مهدی, عبدالخانی, علی, جمالی راد, لعیا. تاثیر خمیرسازی شیمیایی باگاس و جفت‌کننده روی خواص فیزیکی-مکانیکی چندسازه‌های حاصل از خمیرکاغذ باگاس/ پلی‌اتیلن‌سبک. مجله صنایع چوب و کاغذ ایران, 1395; 7(3): 349-362. در این تحقیق تأثیر تقویت‌کنندگی الیاف بکر و الیاف حاصل از خمیرسازی شیمیایی باگاس و به‌کارگیری جفت کننده MAPE بر خواص فیزیکی-مکانیکی چندسازه‌های چوب-پلاستیک بر پایه پلی‌اتیلن سبک موردبررسی قرار گرفت. الیاف باگاس از منطقه تحقیقاتی خوزستان تهیه‌شده و پس از بررسی خواص شیمیایی و آناتومی خمیرهای مختلف شیمیایی شامل خمیرکاغذهای مونواتانول‌آمین (MEA)، سولفیت‌قلیایی-آنتراکینون (AS)، سودا رنگبری نشده (UNS) و رنگبری‌شده (BS) از آن تهیه گردید. سپس چندسازه‌ها با مقدار 30% وزنی الیاف به‌وسیله اکسترودر دومارپیچ و قالب‌گیری پرسی ساخته شدند. ویژگی‌های فیزیکی-مکانیکی این چندسازه‌ها مورد تجزیه‌وتحلیل قرارگرفته و با یکدیگر مقایسه شدند. نتایج نشان داد که در طی خمیرکاغذسازی شیمیایی بخشی از لیگنین و همی‌سلولزها حل می‌شود بنابراین قابلیت اتصال و نسبت ابعاد الیاف باگاس بهبود یافته و درنتیجه الیاف خمیرکاغذ باگاس نسبت به الیاف باگاس خام دارای قابلیت تقویت‌کنندگی بهتری هستند. بهترین خواص به‌وسیله الیاف خمیرکاغذ مونو‌اتانول‌آمین و سولفیت قلیایی-آنتراکینون حاصل شد. افزودن 5% وزنی جفت کننده MAPE (مالدئیک‌انیدرید پلی‌اتیلن) به‌طور معنی‌داری مقاومت کششی، مدول کششی، مقاومت به ضربه و واکشیدگی ضخامت را بهبود می‌دهد که باعث انتقال مؤثر تنش از ماتریس به الیاف تقویت‌کننده محکم می‌شود. Faludi, G., Renner, K., Móczó, J. and Pukánszky, B., 2013. Biocomposite from polylactic acid and lignocellulosic fibers: Structure–property correlations. Carbohydrate Polymers, 92: 1767– 1775. Faruk, O., Fink, H.P. and, Sain, M., 2012. Biocomposites reinforced with natural fibers: 2000–2010. Progress in Polymer Science, 37: 1552– 1596. Berzin, F. and Beaugrand, J., 2014. Evolution of lignocellulosic fibre lengths along the screw profile during twin screw compounding with polycaprolactone. Composites: Part A, 59: 30-36. Hietala, M., Niinimäki, J. and Oksman, K., 2011, The effect of pre-softened wood chips on wood fibre aspect ratio and mechanical properties of wood–polymer composites. Composites: Part A, 42: 2110–2116. Hietala, M., 2011. Processing of wood chip–plastic composites: effect on wood particle size, microstructure and mechanical properties. Plastics, Rubber and Composites, 40: 49-56. Kordsachia, O. and Patt, R., 1991. Suitability of different hardwoods and non-wood plants for non-polluting pulp production. Biomass Bioenergy, 1: 225–231. Islam, M.S. and Foreman, N.J., 2010, Influence of alkali treatment on the interfacial and physico-mechanical properties of industrial hemp fibre reinforced polylactic acid composites. Composites: Part A, 41: 596–603. Anamaria S., Totolin, M., Cazacu, G. and Vasile, C., 2012. Low density polyethylene composites containing cellulose pulp fibers. Composites: Part B, 43: 1873–1880. López, S.B., Mansouri, E.I, Mutjé, P. and Vilaseca, F., 2012. PP composites based on mechanical pulp, deinked newspaper and jute strands: A comparative study. Composites: Part B, 43: 3453–3461. Hedjazi, S., Kordsachia, O., Patt, R., Latibari, A. and Tschirner, U., 2009. Alkaline sulfite–anthraquinone (AS/AQ) pulping of wheat straw and totally chlorine free (TCF) bleaching of pulps. Industrial crops and products, 29: 27–36. Georgopoulos, S., Tarantili, P.A, Avgerinos, E., Andreopoulos, A.G. and Koukios, E.G., 2005. Thermoplastic polymers reinforced with fibrous agricultural residues. Polymer Degradation and Stability, 90: 303–312. Du, Y., Yan, N., Kortschot, M.T. and Farnood, R., 2013. Pulp fiber-reinforced thermoset polymer composites: Effects of the pulp fibers and polymer. Composites: Part B, 48:10–17. Kubo S., 2005. Hydrogen bonding in lignin: a Fourier transform infrared model compound study. Biomacromolecules, 6(5):2815–2821. Jonoobi, M., Shakeri, A., Misra, M. and Oksman, K., 2009. Chemical composition, crystallinity, and thermal degradation of bleached and unbleached kenaf bast (Hibiscus cannabinus) pulp and nanofibers. BioResources, 4:626-639. Bledzki, A. K. and Gaaasn, J., 1999. Composites reinforced with cellulose based fibers. Progress in Polymer Science, 24:221–274. Islam, M.S. and Foreman, N.J, 2010. Influence of alkali treatment on the interfacial and physico-mechanical properties of industrial hemp fibre reinforced polylactic acid composites. Composites: Part A, 41: 596–603. Mansouri, N., Espinach, X., Julian, F., Verdaguer, N., Torres, L., Llop, M. and Mutje, P., 2012. Reasearch on the suitability of organosolv semi-chemial triticale fibers as reinforcement for recycled HDPE composites, Bioresources, 7: 5032-5047. Kargarfard, A., 2011. The Effect of Wood Particles Type and Coupling Agent Content on Properties of Composites From Recyceled Polypropylene and Eucalyptus Wood, Journal of Forest and Wood Products, 64: 55-64. (In persian). Nourbakhsh, A., Kargarfard, A., Golbabaei, F. and Kouhpayehzadeh, M., 2014. Investigation on mechanical and thermal properties of giant milkweed (Calotropis persica) fibers -plastics composites.Iranian Journal of Wood and Paper Science Research, 29: 106-116. (In persian). Mohammadi, H., Madhoushi, M. and Zabihzadeh, M., 2014. Flextural .and Tensile properties of Rice Stalk Flour-Polypropylene Composite During Moisture Cyclic Loading, J. of Wood & Forest Science and Technology, 21: 195-206. (In persian). Du, Y., Yan, N., Kortschot, T. and Farnood, R., 2014. Fabrication and characterization of fully biodegradable natural fiber-reinforced poly(lactic acid) composites. Composites: Part B, 56: 717–723. Kargarfard, A., 2013. The Infuence of Coupling Agent and the Content of Fibers on Tensile Strength and Physical Properties of Cotton Fiber Stem/Recycled Polypropylene Composites, Iranian Journal of Wood and Paper Industries, 2: 131-140. (In persian). Shakeri, A., Safdari, V.R., Rohnia, M. and Nourbakhsh, A., 2013. An analysis of the combined effects of isocyanate HMDI and maleic anhydride (MAPE) coupling agents on the mechanical properties of HDPE- wood flour composite. 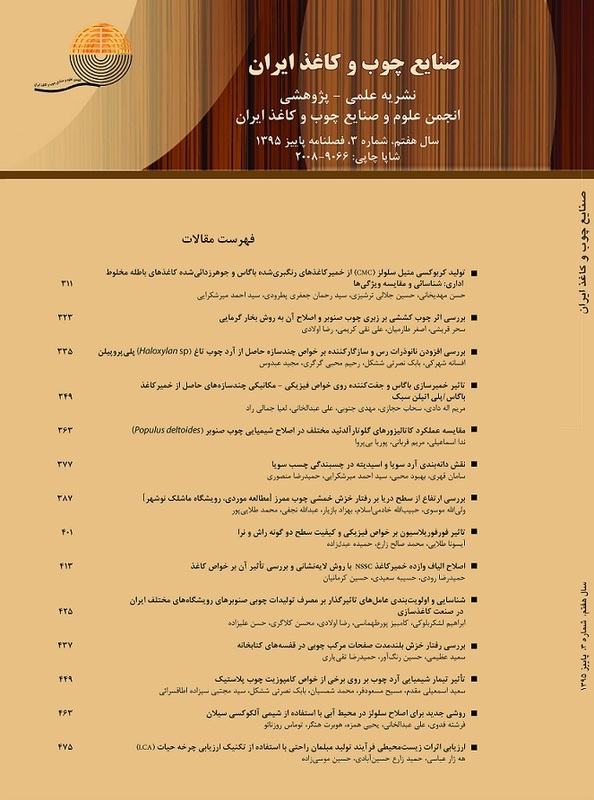 Iranian Journal of Wood and Paper Science Research, 28: 290-300. (In persian). Altun, Y., Dog˘an, M. and Bayramlı, E., 2013. Effect of Alkaline Treatment and Pre-impregnation on Mechanical and Water Absorbtion Properties of Pine Wood Flour Containing Poly (Lactic Acid) Based Green-Composites. J Polym Environ, 21: 850–856. Leu, S.Y, Lo, S.F. and Yang, T.H., 2012. Optimized material composition to improve the physical and mechanical properties of extruded wood–plastic composites (WPCs). Construction and Building Materials, 29: 120–127. Krzysik, N., 1999. Dependence of the mechanical properties of wood flour polymer composites on the moisture content. Applied Polymer Science, 68: 2069-2076. Rowell, M.L. and Jacobson, RE., 2000. Weathering performance of plant-fiber /thermoplastic composites. Cryst. And Liq., 353: 85-94. Hill, C., 2000. Wood/plastic composite strategies for compatibilising the phases. Institute of wood science, 15(3): 140-146.